On top of the new V-Drums TD-17, Roland has also announce a new Life-like looking Kick Drum and impact isolating kick pedals. 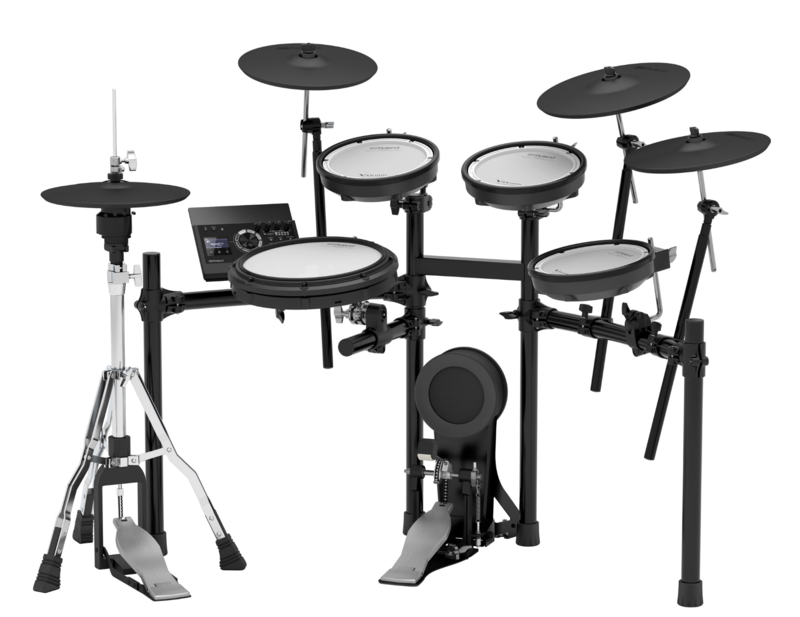 Roland announces the TD-17 series, the latest addition to the acclaimed V-Drums lineup. Combining flagship-level sound with newly developed pads, the TD-17KVX, TD-17KV, and TD-17K-L kits deliver an experience that’s authentically close to playing acoustic drums, accurately mirroring the physical movement, stick coordination, and hand/foot control that every drummer needs. They also include integrated access to an array of motivational coaching functions, plus built-in Bluetooth® for playing along with songs and video lesson content streamed wirelessly from a smartphone. For home-based players who are serious about taking their drumming to the next level, there’s no better choice than a TD-17 series kit. When using a TD-17 series instrument, drummers can play with the same techniques they’d use on acoustic drums, freely and without compromise. At the heart of each kit is the new TD-17 sound module, which provides a superior drumming experience with advanced Prismatic Sound Modeling inherited from Roland’s top-of-the-line TD-50. Its sounds faithfully reproduce the character and tone of acoustic drums, with lightning-fast response time, wide dynamic range, and natural tonal changes that vary depending on where and how hard the pads are played. The TD-17KVX and TD-17KV kits come with the new PDX-12 snare pad, which features a dual mesh head and large 12-inch playing surface that supports the development of stick control and proper playing techniques. The head tension can be adjusted for satisfying natural rebound, while the height of the snare hoop enables the player to hit open rim shots with a natural stick angle. The TD-17KVX also includes the new VH-10 V-Hi-Hat, which mounts on an acoustic hi-hat stand and replicates the natural feel and swinging motion of a real hi-hat cymbal. Offering advanced triggering with continuous open/close detection and bow/edge sounds, the VH-10 allows users to execute traditional playing techniques to perfection. All three kits in the TD-17 series include the new KD-10 kick pad, which combines rock-solid feel with a noise-reducing design that offers quiet operation while playing at home. The KD-10 can be used with any standard kick pedal, and supports dual pedals as well. To learn more about the TD-17 series V-Drums, visit www.Roland.com.